My wife and I are in day three of our St. Thomas vacation and she decided to get her nails done in a little nail salon on the tourist strip in Red Hook and I decided to explore the area a bit. I bought a baseball cap to shield my sunburned forehead, chatted with the shopkeeper and she offered me a seat on her, “husband couch” until my wife’s nails were done but I graciously declined. Having seen all of the tourist shops I could bare (2) I simply stood outside in the blazing heat hoping I wouldn’t get charged with loitering. 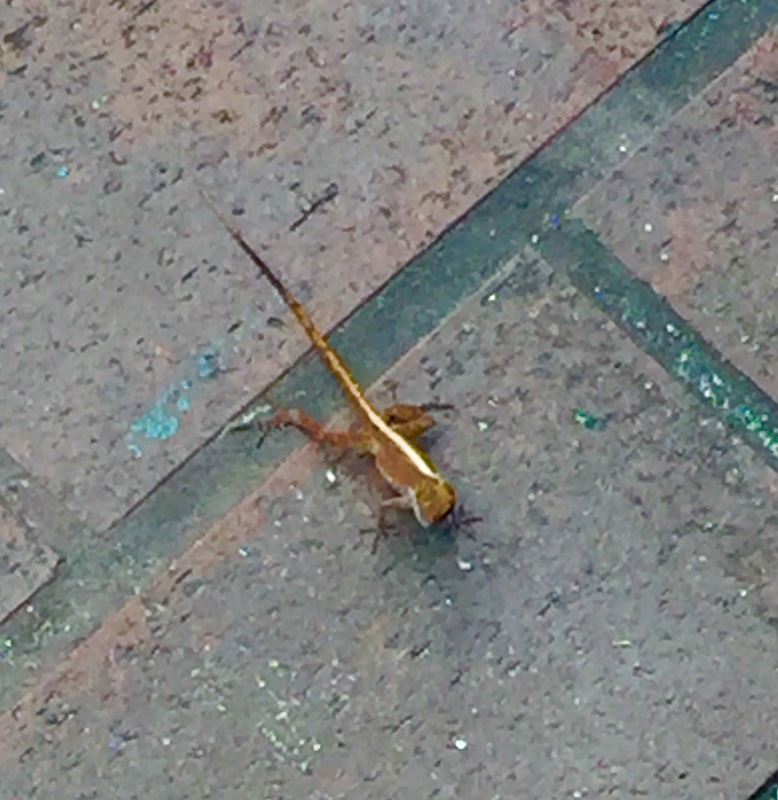 A baby iguana scurried right up to my feet and stared at me tilting his head. Right then I realized that I should make the most of this quiet moment. I decided to catch up on my email for a few minutes so I read James Altucher’s latest blog on minimalism and really connected with it. After I read his blog post I was inspired to write this one, and thought about how everything is connected. Each of our actions cause a ripple effect of which we’ll never know the full extent of. In a way each of us are a tiny epicenter. Since studying the Tao Te Ching and trying to put its teachings into practice I’ve learned life is about surrendering to and making the most of each and every moment. Do I always remember to do this? No, but when I do life just flows better. A successful and joyful life is about learning the lessons, then teaching the lessons you learn in the subtlest most unobtrusive way possible. Most often the best way to teach is merely by example. Sometimes the very best moments in life are completely spontaneous, so we must be prepared to be awake enough to notice when they arise. These moments can be triggered by a blog post or a baby iguana. Your guards must be down and your heart must be open. So many people move to a beautiful place like Saint Thomas believing that living there will solve all of their problems. This much I have learned, paradise is not a place. Paradise is more like an attitude, it’s a state of being. You must begin by radiating happiness wherever your feet are currently planted. When you begin to do this your life will start to miraculously change for the better. I know this trip to St. Thomas is the first leg of the future my wife and I have dreamed about for years: traveling the world; writing; meeting interesting new people; learning; teaching; and loving. I have many more miles to put on these feet, many more beautiful places to visit and so much more to learn but paradise, I’ve already found. It doesn’t matter how good of a writer you think you are, if you can’t figure out how to connect with readers you’re not going to sell anything. Internet marketing for indie authors is especially tough to figure out. Often our budgets are small or even non-existent and the rules are changing often. This is important stuff. If you don’t figure it out eventually you’ll be discouraged enough to give up on your dream. I admit that marketing has never been one of my strong suits. This is one of the reasons it took my writing career so long to take off. I was that skinny and awkward kid with thick glasses that few things came naturally to. I would practice things hundreds of times until I perfected them. One of the few things I had on my side was persistence. I’m still that same kid inside, only larger, with a few gray hairs, and the nagging thought that time goes far too fast to waste it. A month ago I tried to make a poached egg. It ended up looking like egg drop soup. It was terrible. Ten or so attempts and a few YouTube videos later I can make a perfect poached egg. The secret, once I learned it was like magic and made the process easy. What is the secret? Soak the eggs (still in the shell) in white vinegar for five minutes before cracking and boiling them. That was it. Things are incredibly hard until you figure out the secret and then they’re easy. To find success you must have to have the patience and persistence to get to the EASY. Most of us have heard the quote by William Faulkner, “In writing, you must kill all your darlings.” If a sentence or passage doesn’t work for the good of the overall project you must get rid of it no matter how brilliant you think it is. This is excellent advice but it isn’t easy to do partially because of ego but to a greater degree because of fear that you can’t write something better. To become a successful writer you must subdue your ego and have the confidence to believe that great ideas come from an endless source within you. When you believe this amazing things begin to happen. It was a hard thing to accept because I was sure it would work but the whole thing fell flat. I waited for months but all I heard were crickets…not a single response from anyone. Ever. I had to accept it and move on to something new and better. All of us are a constant work in progress. All it really takes in this world to be successful is working through the hard to get to the EASY. I hope your path to easy is a short one. More importantly, I hope you learn quickly from every misstep along the way.